It is a fact that the younger generations rely on the Internet for a lot of things, including searching for restaurants and check out it’s reviews. In fact, more “not so young” generations are starting to embrace the Internet. With the mass adoption of smart phones and tablets, now we could access Internet anyway and anyplace. 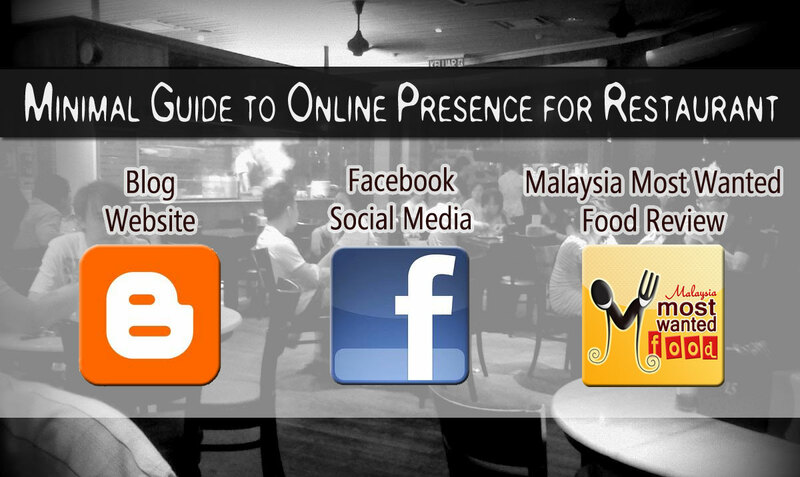 As a restaurant owner, you could no longer afford not to have an Internet presence, else you would risk “not to be found” online. Luckily, it is fairly simple and affordable (free for most of the time) to have an online presence. Every restaurant should have a website or blog, so that your potential customers could find out basic information about your establishment, such as cuisine, menu, photos, contact number, address and a map. A website might be slightly more complicated, costing at least RM600 to design and develop (could cost up to a few thousand, depending on your needs), with a yearly hosting fee of around RM 300. A blog on the other hand, is easier to setup (and update), and it’s FREE! You can try Blogger (also known as Blogspot) or check out Get Malaysian Business Online. Facebook is something which you cannot ignore, and you could use the Facebook page to connect with your customers. Facebook allow you to inform your customers about your latest offerings, and the customer could feedback directly to you. Setting up a Facebook account and Facebook Page is the easy part (most people below 25 knows how to do it, ask them for help if necessary). You should update your Facebook page with something new or interesting at least once a week (preferably 3 times a week). What should restaurant owner update about? Perhaps new menu, new decoration, new dishes, festive promotions, or just showing the photos of happy customers or delicious looking food to get your customers interested. Besides updates, you should look into customer’s comment, complaint or inquiry and respond accordingly (be humble, and don’t try to delete all the bad comments; try to understand and improve). If you created a Facebook page but couldn’t be bothered to login frequently to shower it with some love, then you would end up with low “likes” and no customer participation, which means less people would care about your restaurant. If you have extra time and energy, you could explore Twitter and Google+ as well. You should list your restaurant with a local restaurant review site or directory (usually free), such as Malaysia Most Wanted Food (ahem, shameless plug here). Up to 270,000 readers use our site to discover restaurants for various occasions every month, and it’s vital to keep your restaurant within their radar. Provide the complete information to avoid frustrating your potential customer due to missing address or contact number. To make your restaurant standout among the competitors, you should provide beautiful photo of your restaurant’s environment and delicious-looking food, as most customers do make decision based on visual appeal (and reviews) when dealing with a new restaurant. If you restaurant page isn’t complete or seems interesting, people will assume your restaurant have the same characteristics. After you have established some online presence, you should embark on some online marketing campaign to attract visitors to your website or Facebook, so that they become aware of your restaurant and its offerings. How to do online marketing is a long topic for another time, but you could look into Google Adsense or Facebook Ad for your basic advertising needs. Thanks for sharing this! I think that having an online presence is something that shouldn't be overlooked mainly because a lot of people find recommendations based on what they see online. I think that this is one of the ways that you can improve your restaurant business. One of the other ways that I have been trying to improve my business is that I have been using food service packaging so that our food can be stored and last for quite a bit of time. This article is really useful and I will apply these tips during next project making. Maybe they will also help me during my dissertation writing or in some other situations. I'll wait for some more information from you.